- Weld seams authentically reproduced. Although it didn’t appear in the same numbers as the more common Sd.Kfz. 251, the Sd.Kfz. 250 halftrack played a vital part in the German WWII war effort. Similar in appearance to its larger stable mate, the Sd.Kfz. 250 was based on the chassis of the Sd.Kfz. 10 prime mover. Although the design was accepted in 1939, delays meant it didn’t go into production until June 1941. The armored body of this halftrack was complex, so a version with a simplified body went into production in October 1943 as the neue art (“new version”). 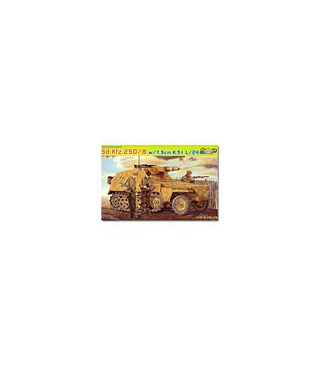 It is this “Neu” version that is represented in Dragon’s latest 1/35 scale kit. This new Premium Edition kit features an Sd.Kfz. 250/8 Neu. It is based on Dragon’s latest Sd.Kfz. 250/1 that sported a number of completely new and upgraded components. The 250/8 was a support version featuring a 7.5cm gun that was issued to reconnaissance companies. The kit portrays the 7.5cm K.51 L/24 gun, which was the final version of the weapon installed on a unified mount in this halftrack. The gun is represented in amazing detail from the rifled barrel to the basket for spent ammo casings. To further improve the kit, the side armor is thinly made to accurately portray the true thickness of the armor plates. As a Premium Edition item, this Sd.Kfz. 250/8 is highly detailed and easy to assemble. For modelers who like German halftracks, this up-to-date example will provide a powerful punch!